The Band of HM Royal Marines Cadets Portsmouth which is a drum and military brass band of over 20 cadets. 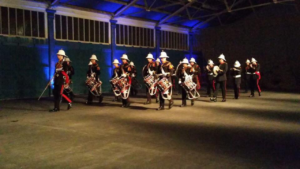 The Corps of Drums of Plymouth Division RMVCC has over 10 cadets form the side, bass and tenor drummers. 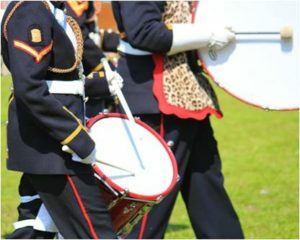 The Band and Corps of Drums both wear the traditional ceremonial Blue uniform as worn today by the Royal Marines Band Service, a privilege granted to very few outside of the Service. 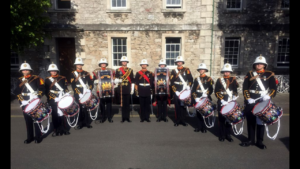 We accept direct entry to the Band for cadets whose musical skills are already well developed, subject to an audition. Our Band and Corps of Drums is also available for public displays for which we may ask for a modest donation to cover costs. Appearing in public not only raises the profile of the Volunteer Cadet Corps but also helps develop cadets’ confidence and allows them to show off their well-earned skills.